Left to right: Haskayne School of Business dean Jim Dewald; University of Calgary president and vice-chancellor Elizabeth Cannon; student from the first B.Comm/B.Sc. 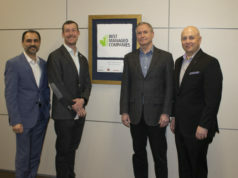 (Eng) cohort Varun Bhatt; donors Linda, Clayton, Carson and Josh Woitas; second cohort student Dani Currie; and Schulich School of Engineering dean Bill Rosehart. Photo by Kelly Hofer. University of Calgary students interested in both engineering and business degrees can now have their cake, and eat it too. With the launch in May of a new engineering and business combined degree program, students can obtain both a B.Sc. (Eng) and B.Comm in as little as five years. 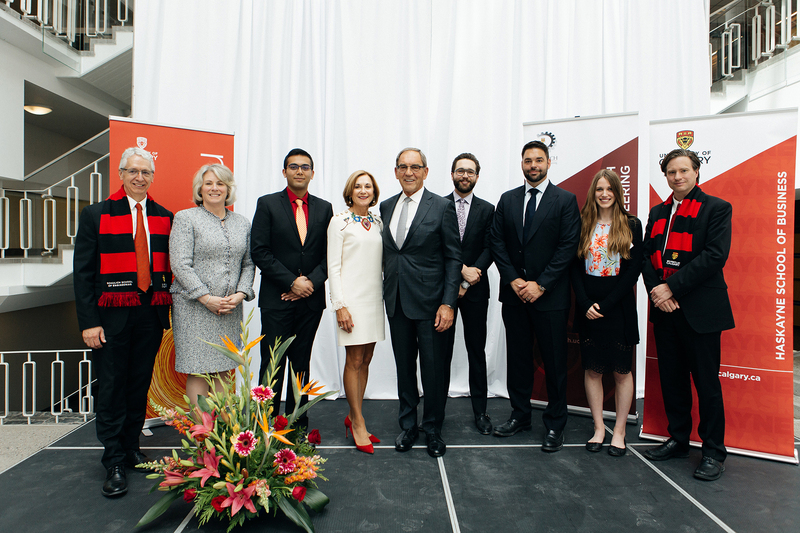 The first of its kind in Western Canada, the program is the combined effort of the Schulich School of Engineering and the Haskayne School of Business, and was launched with the support of a $5-million gift from Clayton and Linda Woitas and family. Their gift is part of the university’s Energize: the Campaign for Eyes High, uCalgary’s $1.3-billion fundraising drive that formally launched in April 2016. The campaign is more than halfway to its goal. The Woitas family’s gift will specifically support delivery of the combined program in and out of the classroom, program marketing, student recruitment and scholarships. The new program is designed to prepare graduates for a wide range of careers in engineering, business, management and all areas in between. Students will be able to take a mixture of engineering, science, arts and business courses, access student and career services from both the Schulich and Haskayne schools, and apply for an optional 12 to 16 month paid internship with the Engineering Career Centre. Jim Dewald, dean of the Haskayne School of Business and an engineer with business degrees, says the new program will help future engineers better understand the business side of their projects, while better equipping entrepreneurial-minded innovators to start businesses. “This kind of program is long overdue in a city like Calgary and I am confident these students will make a significant impact in our community,” he says. Previous articleWhat is the NDP Government Really Doing?